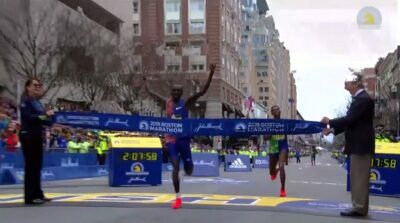 BOSTON — In one of the most thrilling finishes in the 123-year history of the Boston Marathon, Kenya’s Lawrence Cherono, the two-time Amsterdam and Honolulu champ, outsprinted two-time Boston champion Lelisa Desisa of Ethiopia to win his first World Marathon Major in 2:07:57 on Monday. Cherono ran his final mile in 4:29 as Desisa, who had the lead for most of the final 600, was second in 2:07:59, two seconds behind. 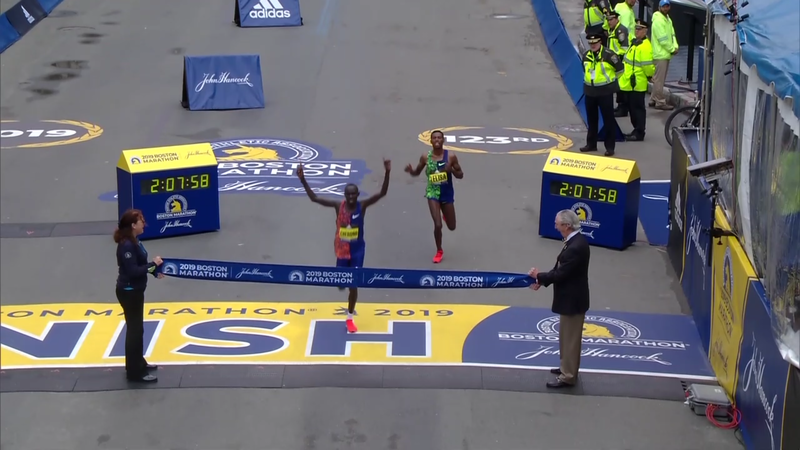 It tied for the third-smallest margin of victory in race history, and was the closest finish since 2000, when Elijah Lagat defeated Gezahegne Abera, with both men credited with the same 2:09:47 time. The two second margin of difference today wasn’t a fair indication of how close this was as Desisa stopped the final few meters. Watch the sprint below. The final mile was riveting as with less than 800 meters remaining there was a three-way tie for the lead with Kenya’s Kenneth Kipkemoi, who ended up third in 2:08:07, Cherono, and Desisa running three abreast. It was also a big day for the Americans as Scott Fauble and Jared Ward both broke 2:10 — other than Galen Rupp, no American had done that since Meb Keflezighi’s Boston win five years ago. Fauble, who was with the lead pack as late as 21 miles, took 7th in 2:09:09, with Ward taking 8th in 2:09:25. Both men achieved the 2020 Olympic standard by virtue of their top-10 finish. We’ve got a separate article dedicated to the American men, which you can read here. The race began in Hopkinton with decent conditions for running — 56 degrees Fahrenheit, a 6 mph tailwind — but 93% humidity. While several Americans took turns leading up front — Elkanah Kibet during mile 8, Dathan Ritzenhein during mile 10, and Ward during mile 13 — no one was running fast enough to break away, and at halfway (1:04:28), 12 men were within five seconds of the lead. 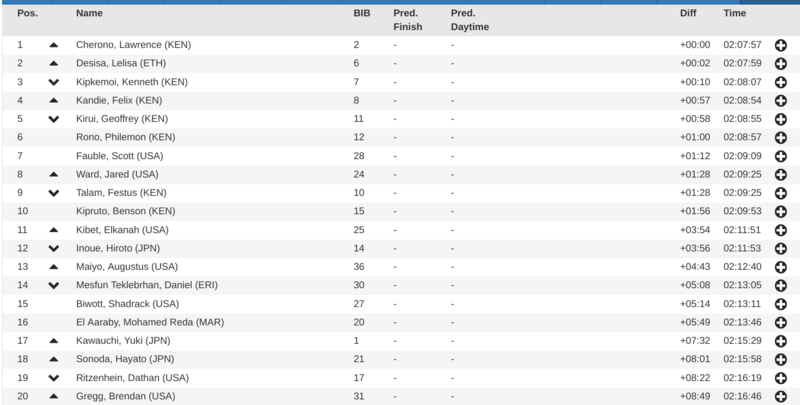 At that point, Ward was the only American in the front pack, but Fauble had caught up by 16 miles, with Shadrack Biwott and Dathan Ritzenhein also trying to make up the gap. But Fauble would be the only American to survive the Newton Hills, the leaders running 5:07 for mile 21 up Heartbreak Hill. 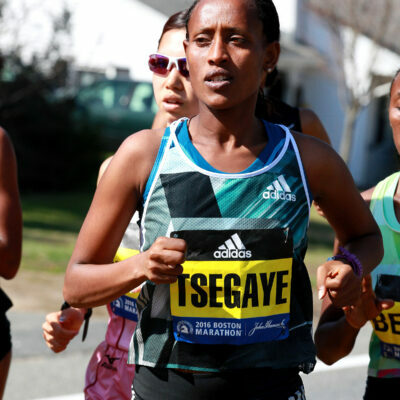 That left Fauble and seven East Africans — including former Boston champs Desisa and Geoffrey Kirui. That is when the racing really got going. The leaders ran mile 22 in 4:46, and as they made the turn through Cleveland Circle, Fauble was struggling to hang on. A 4:48 23rd mile claimed Sisay Lemma and Felix Kandie, and it was down to four men: Cherono, Desisa, Kirui, and 2018 Rotterdam Marathon Kenneth Kipkemoi. It was Kipkemoi who took the race by the scruff of the neck, ripping off a 4:31 for the downhill 24th mile, and that was too rich for Kirui’s blood, the 2017 champ falling back. That left three men in the lead pack. Two Kenyans, and one Ethiopian. Two men looking to win their first major marathon and one, Desisa, looking for his fourth (and third Boston title). 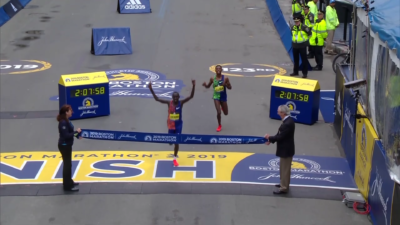 They ran a 4:39 25th mile together through Kenmore Square, Desisa hanging back just slightly, waiting for the right time to make the big move. That came on the right turn onto Hereford Street with roughly half a mile to go. 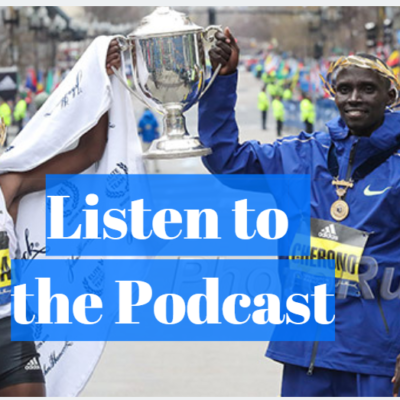 Desisa opened a gap on both Kenyans, but as they took the fabled left turn on Boylston Street, Cherono began closing, and as they passed the 26-mile mark he was right on Desisa’s shoulders. With 100 meters to go, Desisa felt Cherono gaining on him. Out of instinct, he threw his right arm out to prevent Cherono from passing, but quickly refocused his energy as both men began sprinting. Desisa was digging as deep as he could to hold off the charge of Cherono, gritting his teeth and flailing his arms, but it was not to be. Five meters before the line, Desisa realized he was beaten, and Cherono was able to throw up his arms in victory as he broke the tape in 2:07:57 to clinch a famous victory. The final margin read two seconds, but in reality it had been closer than that, Desisa slowing in the final strides after concluding he could not win. Analysis and top 25 results appear below. It doesn’t get any better than a sprint finish between two studs for the Boston Marathon title. You could see the raw desire on the faces of both Cherono and Desisa, and the only shame was that one of them had to lose. If watching that finish didn’t get your juices flowing, then running is not the sport for you. Because that was as good as it gets. Before today, Cherono was one of the leading candidates for “best runner never to have won a major,” with two course records in both Honolulu and Amsterdam and a PR of 2:04:06 (of course, Cherono had only run one major before today, finishing 7th in London last year). 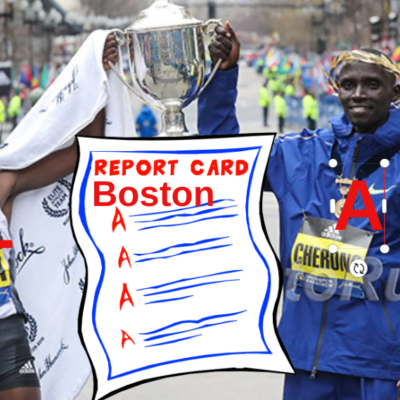 With his CR in Amsterdam last fall and his win today over Desisa — a total stud coming off a 2:05 win in NYC last fall — Cherono now has to be mentioned in the discussion of best marathoner alive not named Eliud Kipchoge. One of the myths we at LetsRun.com have tried to dispel over the years is that flat-out sprint speed and track times don’t determine who wins in a sprint finish in a marathon. In the post-race press conference, Cherono was asked whether he thought he would prevail in a sprint given he had the fastest PR in the field. Both of Desisa’s last two marathons have come down to the wire; today, he lost to Cherono by two seconds, but last fall in New York, he held off Shura Kitata to win by two seconds. In that race, he dropped Geoffrey Kamworor during mile 26 before Kitata made a late charge to try to catch him. 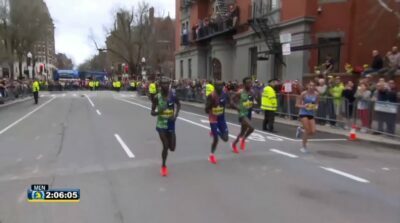 Today, Desisa tried something similar, making his big push on Hereford Street at the end of mile 26, but unlike Kamworor, Cherono covered the move. Desisa looked visibly uncomfortable in the final 100 meters — much worse than Cherono — and slowed just before the finish, but Desisa said there was nothing wrong with him. He was simply out of gas, and knew that when Cherono finally edged ahead, there was nothing he could do. 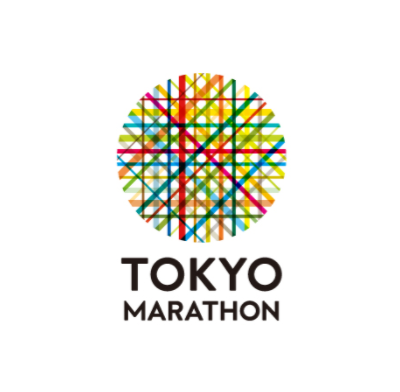 Last year, in horrific conditions, Japan’s Yuki Kawauchi ran 2:15:58 and won the race. Today, when conditions were conducive to running fast, Kawauchi only ran a tiny bit faster – 2:15:29. As a result, he finished just 17th. The first half split in both races were similar – 65:59 for Kawauchi last year and 66:01 last year. 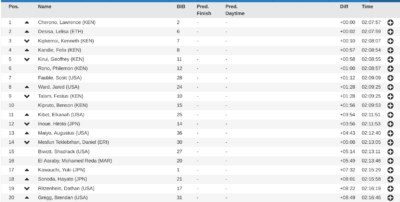 What was bizarre about Kawauchi’s race today is he crushed the last mile. Even though Kawauchi was fading to a 69:28 second half (that’s over 5:18 mile pace) and seemingly had little to run for except for pride, he somehow managed to run the last mile in 5:02. That blows our mind. 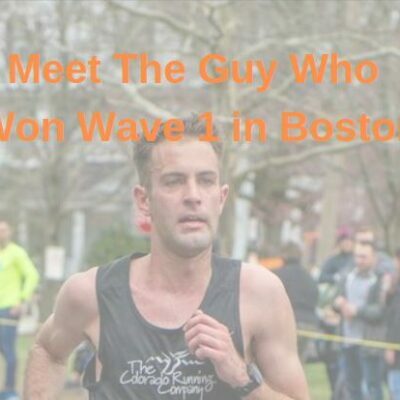 Talk about the 2019 Boston Marathon our our world famous messageboard. MB: US Commentary for BOSTON = The first half of the coverage was almost unwatchable. You can’t cover 4 events at once.